Convolution is one of the fundamental concepts of image processing (and more generally, signal processing). 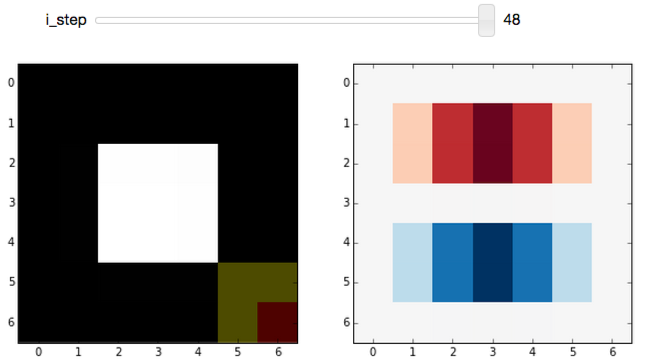 For the scikit-image tutorial at Scipy 2014, I created an IPython widget to help visualize convolution. This post explains that widget in more detail. Only a small portion of this post is actually about using the widget API. IPython notebook widgets have a really easy-to-use API, so only a small bit of code is necessary. 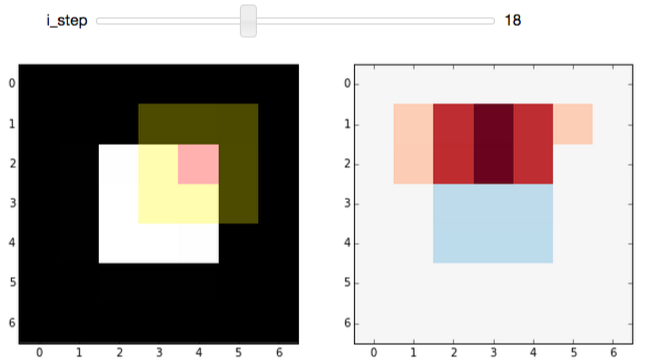 That said, this is a really nice demo of both image convolution and the usefulness of IPython widgets. I highly recommend setting the default colormap to 'gray' for images and pretty much everything else. (There are, however, exceptions, as you'll see below.) Also, using nearest neighbor interpolation (which is what 'none' does for zoomed-in images) makes pixel boundaries clearer. # Ignore the Gaussian filter, for now. As the variable names suggest, this filter highlights the horizontal edges of an image. We'll see what's happening here later on. The slider in the widget allows you to step through the convolution process for each pixel in an image. The image (a white square with a black background) used for the demo is really boring to make the filtering process clearer. The plot on the left shows the original, unfiltered, image. On top of that, we overlay the kernel position: The center pixel of the kernel is tinted red, and the remaining pixels in the kernel are tinted yellow. The red pixel is the one being replaced by the current step of the convolution procedure, while red and yellow pixels are used to determine the replacement value. 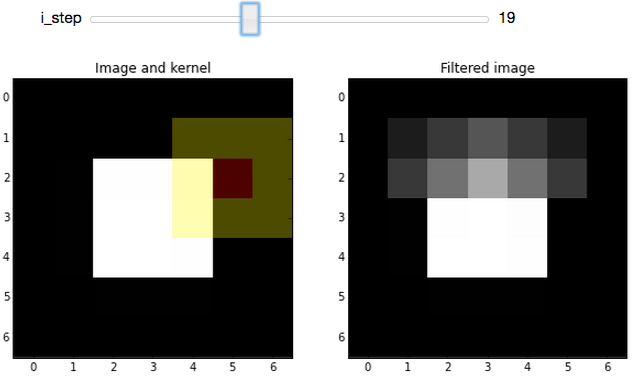 On the right, we see the image at the ith step of the convolution process, which gives the (partially) filtered result. Before we get started though, let's define some helper functions. Helper functions are great: They make code much more readable and reusable, which is what we should all be striving for. It's not necessary to understand these functions right away. You can easily skip over this for now, and revisit it if you have questions about the actual widget implementation. The function names, themselves, should be enough to describe their... ahem... functionality (except for iter_kernel_labels, that one's tough to describe succinctly).
""" 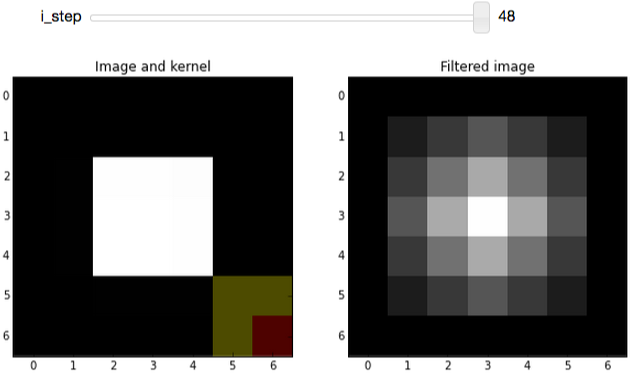 Yield pixel position (row, column) and pixel intensity. """ This "yields" the row, column, and pixel value for each iteration of a loop. By the way: You wouldn't normally loop over pixels (since Python loops are a bit slow) but the whole point of this widget is to go step-by-step. What's the hardest part of any math problem (discrete, or otherwise)? There are many different solutions to dealing with boundaries; what we're going to do is just pad the input image with zeros based on the size of the kernel.
""" Return the amount of padding needed for each side of an image. extra columns on the left and right. # Slice to ignore RGB channels if they exist. # We only handle kernels with odd dimensions so make sure that's true. 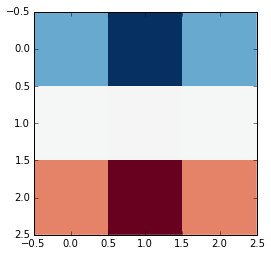 The center parameter is just the (row, column) index corresponding to the center of the image patch where we'll be applying the convolution kernel. The values in this array are carefully chosen: The first and second digit match the row and column index. Technically, convolution requires flipping the kernel horizontally and vertically, but that's not really an important detail here.
""" 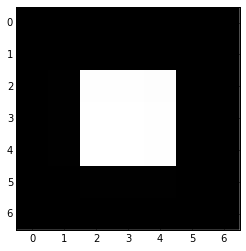 Yield position and kernel labels for each pixel in the image. pixel "under" the kernel. Pixels not under the kernel are labeled as 0. Note that the mask is the same size as the input image. # Shift the center of the kernel to ignore padded border.
""" Return a composite image, where 1's are yellow and 2's are red. See `iter_kernel_labels` for info on the meaning of 1 and 2. Here we color the center value (i.e. 2) red and neighboring values (i.e. 1) yellow. The background value (i.e. 0) is transparent. So all of the above helper functions were just to get us to this point: Making our own IPython widget. But before that (such a tease), here's a really basic example of IPython widgets, in case the concept is completely new to you. # This should be executed in an IPython notebook! If you run this code in an IPython notebook, you should see a slider and i = 5 printed by default. Moving the slider changes the value printed by printer. The keyword argument, i, must match the argument name in printer; that's how slider value gets connected to the printer function. First, I wanted to make something that's fairly reusable. To that end, the following code snippet creates a function that returns the function passed to widgets.interact. That way we can prep the image and cache results (see below). I'm going to do a bit of work here to cache results so that the demo function only computes the filtered result for each pixel once. 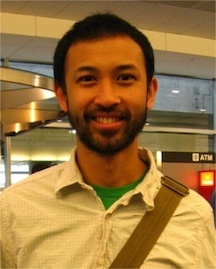 Basically, we iterate over pixels in order, so we can cache a result for a pixel, and then we reuse the result to compute the result for the next pixel. # a pixel once. The cached result is used, if we step back.
""" 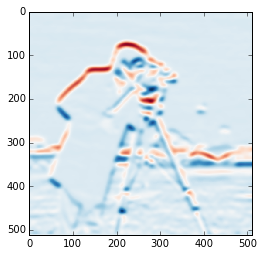 Plot original image and kernel-overlay next to filtered image. calculate all necessary images, then plot the requested step. # Save images for reuse. but that would start with the slider at the midpoint, which isn't ideal for this particular demo. Up until this point, the code written here would work perfectly well in a normal python script. To actually use the widget, however, we need to execute the following lines in an IPython notebook (Download Notebook). These weights will then be multiplied by pixel intensities using apply_kernel. This sets up the widget at the first step of the convolution process. (As with most arrays/matrices, we'll start counting at the top-left corner). 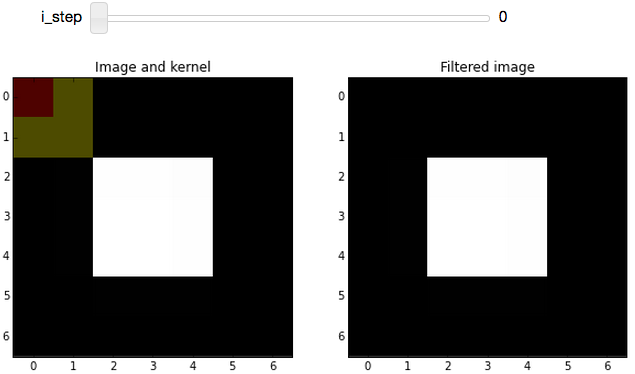 The filtered image (on the right) is unchanged because the kernel is centered on a very boring region (all zeros; including the out-of-bounds values, which are padded with zeros). 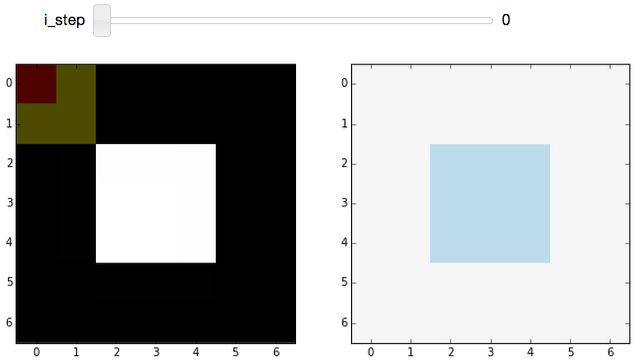 Boundary conditions, revisited: If you look at i_step = 0, you can see why we went through the trouble of defining all that image-padding code: If we want to apply the convolution kernel to the top-left pixel, it has no neighbors above it or to the left. Adding padding (which was removed for display) allows us to handle those cases without too much trouble. In the filtered result, hard edges are smoothed: Since a pixel on an edge will be bordering both white and black pixels, the filtered result will be gray. This smoothing effect can be useful for blurring an image or removing noise (although edge-preserving denoising filters are probably preferable). Finally, let's look at another really useful and easy-to-understand filter: The edge filter. For images, edges are basically boundaries between light and dark values. An easy way to calculate that is to take the difference of neighboring values. Basically, using this kernel to calculate a weighted sum will subtract neighboring values below the center pixel from those above the center. If pixels above and below the center are the same, the filtered result is 0, but if they are very different, we get a strong "edge" response. This filter responds to horizontal edges (i.e. it is sensitive to the orientation of the edge). The filter responds differently when going from white-to-black vs black-to-white (i.e. it is sensitive to the direction of the edge). The edge response diminishes as it approaches a vertical boundary. This is because the kernel has a finite width (i.e. it's 3x3 instead of 3x1). Often, you don't really care about the orientation or direction of the edge. In that case, you would just combine the horizontal-edge filter with the corresponding vertical-edge filter and calculate the gradient magnitude. This is exactly what the standard Sobel filter does. I hope that clarifies the idea of convolution filters. Why did the first example use a gaussian_filter? Edge filters (which are basically just derivatives) enhance noise. We do some smoothing beforehand to reduce the likelihood of false edges. Why are the "edges" (the red and blue regions) in that last filtered image so thick? The edge filter used here gives what's called a "centered difference". In reality, the edges lie in-between pixel values, so the closest we can get (without biasing the edge up or down) is to mark the pixels above and below the edge. What do you mean by "neighbors" and "under" the kernel? In the kernel overlay, red marks the center pixel, yellow marks the neighbors, and both red and yellow pixels are "under" the kernel. No. The widget steps from the top-left pixel down to the bottom-right pixel, but this order is arbitrary. The filtered value at each step is calculated from the original values so previous steps don't matter. 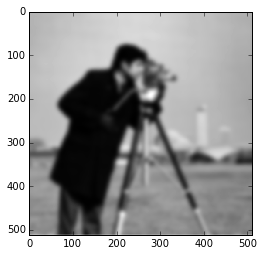 Generic (local) filters work in a similar fashion to the convolution filters described above, but they aren't limited to a linear, weighted sum. Denoising filters for removing noise without smoothing edges. Morphological filters for manipulating shapes.